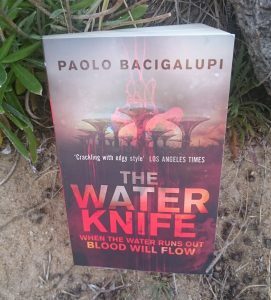 The Water Knife by Paolo Bacigalupi is slick speculative noir. Water has become a volatile commodity in a thirsty world and only those with credit can get a sip. The story is predominantly set in the city of Phoenix, Arizona, United States, and told from the three character perspectives. Angel Velasquez is the titular water knife, a high ranked corporate soldier and confidant to a Las Vegas water oligarch. Lucy Monroe, a Pulitzer Prize journalist and social crusader is appointed by her conscience to a story she can’t walk away from. Maria Villarosa, living on the fringe and scrambling to survive is surrounded by vicious criminals and deceiving coyotes (people smugglers), their crime lord boss has a fetish for feeding people to his pet hyenas. Angel, Lucy and Maria’s paths intersect in the crumbling city lit in flickering neon, when whispers and rumour of a forgotten artefact saturated in blood is out in the open for anyone to claim. It is a treasure that attracts rival states and corporations willing to tear the city apart for possession of it. Bacigalupi paints a world empty of mercy, where corporations and states engage in hostilities over tributaries and the people fight over the scraps bringing out the worse in humanity. People are people, and when faced with apocalyptic water shortages they’ll do anything to have just a briefest taste of free running water. There’s a sense of social desolation, and power is granted to whoever is holding a gun or has a limitless credit card. In contrast the affluent and privileged are kept cool in their glass and steel havens, the arcologies, glimmering technological jewels with cool filtered air and clean water. The rest of the population are left to endure in oppressive heat and choking sand storms. The story begins with a mystery, a gruesome murder, an introduction to the heavy noir influence with its accompanying tropes, betrayal, corrupt authorities, and an anti-hero struggling against their grey morals to do some good. The action set pieces are violent and serrated, leaving a coppery taste on the palate. Having it set in this speculative world provoked some thoughtful insight on the environment which I could relate to living in Australia, the sunburnt country, which has had its fair share of droughts and water shortages. The ending was satisfying, tying up the main characters separate threads while maintaining the ambiguous genre finale. The novel overall was a good read and I would recommend it.